Hi everyone! I just found this site today and it seems like a really cool place to share info. Not only am I building my dream tank using locally collected species, but I'm trying to duplicate as close as possible an Oyster Reef biotope. In addition, I've kept local species in the past with some very cool tanks, one was a stream tank with darters and minnows. All went well with that until a smallmouth bass grew to a large enough size to consume all of his tank mates. That bass lived for several years in that 55 gallon tank. One of my dreams was to duplicate the oyster reef environment of the Chesapeake Bay as best I can without predation. I had a tank and sump built for this a couple years back, and almost finished a stand but personal troubles in my life have caused me some delay. 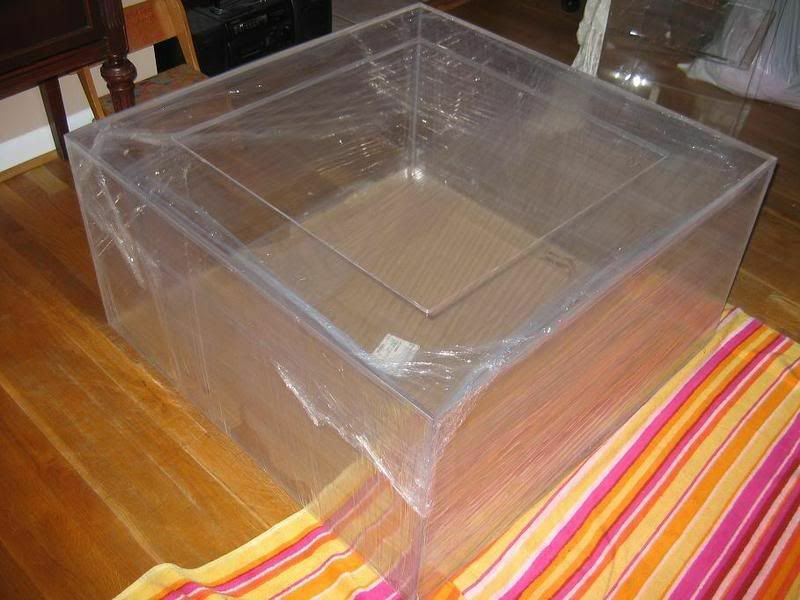 The tank is a 101 gallon cube (36"X36"X18"), and the sump/refugium is 36"X18"17". 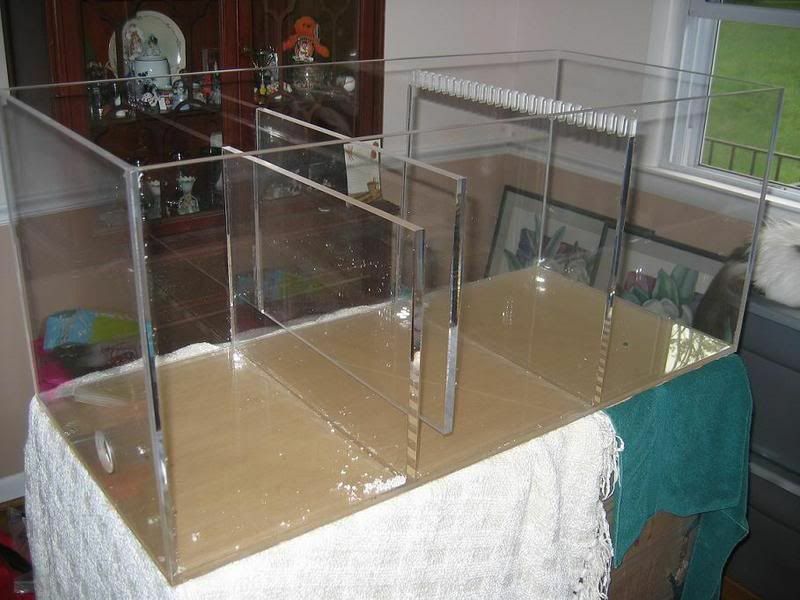 The tank will have live sand from the Chesapeake Bay, and I'm going to try a mud bottom for the refugium. I'm thinking about serious reefkeeping like lighting, perhaps even LED if I can save enough money. It's not wattage and intensity that I'm after, but rather I want to duplicate lunar cycles, daylight and nighttime lighting transitions and seasonal variances in an attempt to induce spawning behavior. I hope to obtain filtration using live filter feeding organisms, oysters and perhaps mussels, tunicates, sponges, etc. although I realize that I'd have to find some way to supplement feeding. The sump will hopefully be a good supply of planktonic critters, although I may try to build a plankton reactor later on if that doesn't work. I'm not sure yet about what macro algae I'll use in the sump, but I might try and find some local stuff before moving on to non-Maryland species. Ghost shrimp, hermit crabs, snails, etc. for clean up crew that live in the bay. just about any critter that comes in on the rocks (fish will not be introduced for 6 weeks after the tank cycles and they are QT'd to reduce parasitism). I may try my luck at some of the other species of fish too eventually, maybe even a hogchoker. I'll attempt another reefkeeping technique, live rock. However, the rock in my area of the bay typically is composed of clay and is of no biological use. So, my goal is to collect or plant cinder blocks or artificially made live rock (cement based) and build the oyster reef on that foundation. Using Bay substrate and rock when possible will help establish the biological filtration of the tank quickly, so maybe not much cycling involved. The Chesapeake bay is brackish and the salinity varies based on rainfall and runoff, but these fish have bred in captivity with a salinity of 1.015 or so. Temperatures range from winter cold to brutally warm in the shallows of the bay, yet all of these fish thrive in this environment. I might even use a controller to simulate seasonal temperature changes, although not as extreme as the shallows of the Bay. Chasmodes bosquianus and the other fish are also found in Florida waters, so I don't think that temperature is an issue. Water parameters in the Chesapeake are constanty changing too, making it tough for sensitive species to thrive there. These fish live all year long with temperatures fluctuating from 40's to even upper 80's and salinity ranging from near fresh water to near ocean salinity in the Bay. Even the invertebrate species found in this biotope have to endure severe fluctuations. Probably T5s, but am thinking about LEDs. Either way, my goal is to simulate as best as possible moonlight phases and seasonal lighting photo periods to try and induce spawning behavior. I plan to not use a skimmer and rather go with using filter feeding organisms, especially in the sump, along with cultivating macro algae for nutrient export. I think that most of the invertebrates will be hydroids, hardy anemones, tunicates, oysters, barnacles and mussels, and other filter feeders. Eventually I may use supplemental planktonic feed products perhaps. These inverts don't need as much light. In addition, the bay waters are pretty much mostly murky and filled with nutrients (both natural and, unfortunately, man introduced). Of course, frequent testing and water changes will be in my regimen to make sure that things go well. My main concern isn't so much the inverts here, but getting these fish to breed and thrive. If the biotope works out and I can keep all of these critters successfully, then so much the better Also, my other concerns include making sure that the life in the tank benefits from the amounts of nutrients at any given time (and I will have to chart and monitor what levels are best), at the same time having water clarity good enough to study the inhabitants. Top off water will come via using an RO/DI unit. Another thing that I'd like to simulate is the tide and water movements, not lowering the water but currents. I can use directional flow to simulate water moving in and out of the mouth of a tidal creek for example, where a dock with an oyster reef may reside and form the habitat that I'm trying to duplicate. Not only will this help keep the critters feeling at home, frequent current and no dead zones in the tank should help with algae control. There are plenty of algae eating snails and probably hermit crabs too in the bay. I can keep them well stocked in my tank. They should be easy to collect. The fish should leave them alone. In addition to placing DIY rock in the bay, I think that I can also make a basket/milk crate and fill it with oyster shells to collect animals. I'll need permission and a good location to place these, that is the next issue. The oyster shell basket will allow me to easily collect greater numbers of blennies, much more than the netting techniques that I've been using. I may also get more species diversity this way, including invertebrates. Now all I need to do is find a place to put my DIY rock and my oyster shells. I've thought about placing them below a major bridge piling or perhaps a public pier. But I think that the best approach is to find someone who has access to private pier that would give me permission to place my baskets. Not an easy task for sure. Another issue surrounds the collection of oysters. In Maryland, I have to be careful to collect in designated areas. Even though they aren't for consumption, I need to make sure that I'm compliant with local laws which change frequently. Another option would be to buy some fresh oysters directly from a waterman, right off the boat. It will cost me some money, but at least I'd know that I'm legal. I think that in this system there may not be a wrong way to do it simply because these animals are so hardy. That said, I'd like to find a successful system and give these animals optimal conditions... This system won't have the color and beauty of a reef, but it will have it's own appeal. Actually, the male striped blenny gets extremely colorful during spawning! If that happens then I'll know I'm on the right track. Keeping oysters alive is what drives my goal of using a natural unskimmed filtration method with heavy use of macro algae for nutrient export. Also, I was hoping to find a bunch of tunicates to put in the fuge as well and a few other filter feeders too for more filtration. I may have to supplement feeding to keep them alive with purchased planktonic foods, but still it would be very cool to succeed at this. The creation of this biotope is a goal, but having an accurate and complete one might be out of the question. The blennies are the feature fish, so those will be my main concern, and that is creating a good breeding habitat with the simulation of an accurate biotope. So, my goal of keeping filter feeding invertebrates might not be doable. I'm going to give it a try though. I have no idea what problems I will encounter. Algae blooms are a primary concern, also perhaps parasitism... I have a QT system already in place, so maybe that will help. I'm going to try and duplicate this environment as best I can. Most of the fish you see in this video are gobies, but you get a good look at the blennies at the end of the video (last minute). It would be very cool to exactly duplicate this with oysters and barnacles, but I don't think that it will be possible. Anyway, enjoy the video. In the mean time I have a lot of work to do to get this project going again...next update will be hopefully in the next month or so, maybe sooner. Edited by Chasmodes, 22 November 2010 - 05:39 PM. I'm confused. What does the comment mean "I hope you﻿ sleep well knowing that your sole job is putting others﻿ out of business!" on the Great Wicomico Oyster Reef video youtube.com/watch?v=wOS5JV-yoBc&feature=related ? Edited by EricaWieser, 22 November 2010 - 06:17 PM. I'm confused. What does the comment "I hope you﻿ sleep well knowing that your sole job is putting others﻿ out of business!" on the Great Wicomico Oyster Reef video youtube.com/watch?v=wOS5JV-yoBc&feature=related mean? Basically, an oyster reef is a reef composed of generations of living oysters each initially attaching to an existing oyster or dead oyster shell. Some of these reefs in the Chesapeake Bay are millions of years old. They create habitat for many different species. The water is basically brackish but saltier towards more Southern areas of the bay, so the species diversity is pretty impressive. Most people think of reefs as being mostly coral, but there isn't much coral in Maryland's temperate waters, so the niche is filled with oysters. Oyster young or larvae are known as "spat", and are free floating but at a point in their development will attach to some hard substrate, usually existing oyster shells or beds, and begin their life. The oyster reefs in Maryland are in trouble though. Sedimentation, siltation, and pollution threaten their survival. Lot's of waterman make a living on harvesting oysters, crabs, fish, etc. and many of them used to specialize in oysters. Now there are efforts to restore reefs, building new reefs by placing lots of oyster shells in productive areas that are less likely to silt over. Also, there is a program to make oyster baskets, basically these are oyster habitat that are built on floating objects near piers and pilings which also protects them from siltation. Edited by Chasmodes, 22 November 2010 - 06:24 PM. Also, if you're building your own tank why are you making it so small? Four feet by three six is like... 80 gallons? (I'm estimating). How many gallons is it? I mean, I'm planning to build my own tank next year, and I want to make it more like a 400 gallon plywood and pond sealant design. Edited by EricaWieser, 22 November 2010 - 06:27 PM. About tank size, I agree, bigger is better. But space is an issue in my home. Plus, blennies don't need a lot of room. 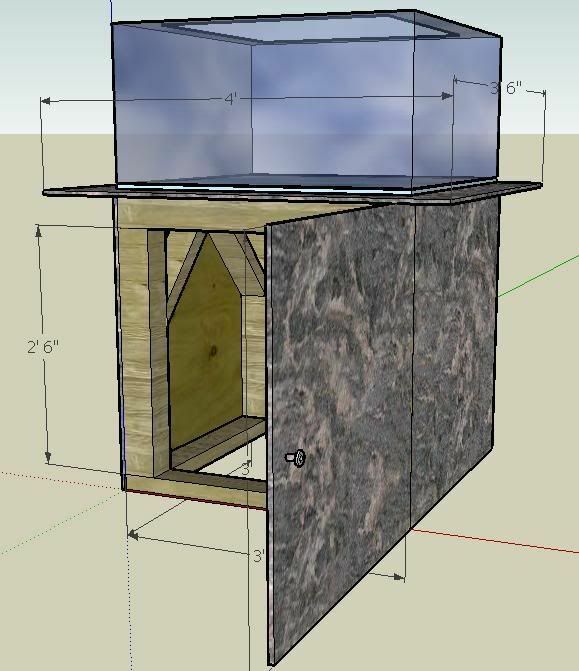 The tank holds 101 gallons, but with rockwork it will probably be about 80 gallons, but the sump is also another 50 gallons or so, so the total water volumn should be about 120 to 130 gallons. I went for the cube concept simply because of the added depth, giving the view the impression of a larger system. I would like to build a large tank some day, but it would most likely be a Caribbean biotope with a Queen Angelfish as the feature. That tank of pictured on your link is awesome! I may have to model my long term dream after your 400 gallon tank. This dream is a few years and thousands of dollars to be saved away right now! If I can hit the lotto then maybe I can get it done faster!!!!!! Unfortunately for me, I'd have to build an addition to my house for that tank to fit, perhaps change my carport into a fish tank room. I've seriously thought of doing that. If I go that route, then I'd probably build the tank out of concrete and plywood. Oh, if I only had that extra money. Edited by Chasmodes, 22 November 2010 - 06:39 PM. Near project. I'm excited to see and hear more about it as you progress. This sounds like a fun project! I look forward to seeing your progress. Have you considered a turf algae scrubber as part of your filtration? They are supposed to be more efficient than submerged algae, and may also act as mesocrustacean farms, producing lots of treats for your blennies. Captain John Smith (of Pocahontas fame) remarked on the Chesapeake's astonishing clarity when he explored it. The bottom was visible in water 20-30 feet deep, and the filtering capacity of the oyster reefs was the primary reason. Of course, reduction in oyster numbers, shipping traffic, and increased nutrient and sediment input since then has left the bay considerably murkier. I was just checking out your sump stand plan. So the sump will sit just a little lower than the main tank? Will it be beside it? Also, you might want to move the uprights on the sump stand directly beneath the upper frame, like you have in the main tank stand. Otherwise a lot of weight is resting on the fasteners rather than the uprights. How do you intend to reconstruct the reef? Using shells or live rock? Yeah, the sump will be about a foot lower when all is done. It will be behind a wall in my basement plumbed through the wall. The stand will probably be a little different than the plan. The extra space was initially a spot to house equipment and the support really isn't needed, but I thought it couldn't hurt. 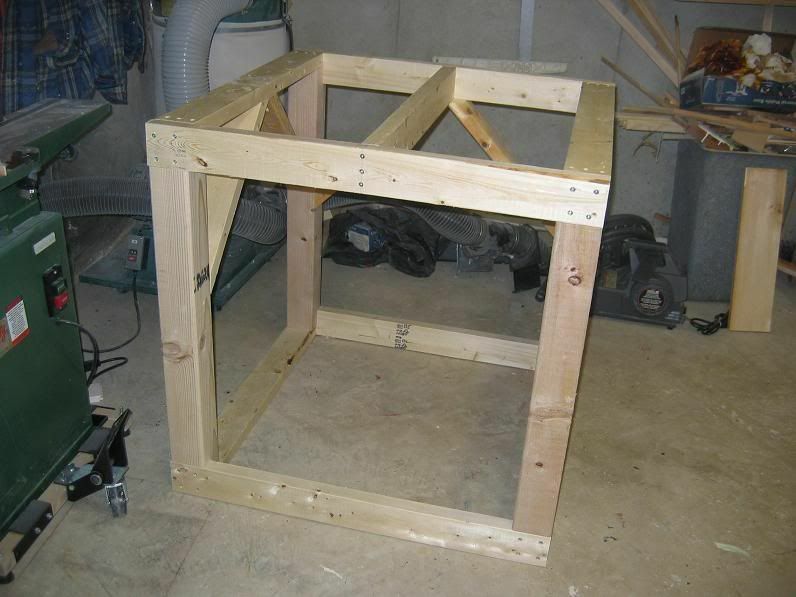 Plus, I already have the 2X4's and needed something else for the wood Do you think the sump should be lower? I was trying to reduce the load on the pumps as much as possible. Edited by Chasmodes, 23 November 2010 - 12:42 PM. Have you considered a turf algae scrubber as part of your filtration? They are supposed to be more efficient than submerged algae, and may also act as mesocrustacean farms, producing lots of treats for your blennies. Thanks Nathan, I'll look into that. I'm game for anything that will produce enough food for both the fish and filter feeders. From what I've read about keeping live oysters, the biggest drawback is that they seem to starve. Most people that I know that have tried attempted to keep live oysters in reef tanks with lots of soft and stony corals, etc., so it might be that most of the food is eaten by the corals. If the oysters dominate the tanks and get enough food, then maybe I can keep them alive longer. Anyway, the oysters really aren't essential to the concept in the long run, but if I can do it then it makes the tank that much more exciting. I've seen threads on this site this concept and I wonder how successful they were in the long term. I don't want a death tank where I can restock if things go wrong. Rather, I want the environment and the fish to exist as if they do in the wild. I think that most people strive for that too. I'm sure that I'll have some ups and downs, but I think in the long run it will work out. I was reading the following excerpt from the MD DNR site about Oyster Reefs and found it interesting. I've pasted a section here that describes how they view an oyster reef. This paper also stated that oysters can filter up to 5 litres of water per day! The hard substrate of the oyster supplies important habitat for many invertebrates and fish. Oyster reefs provide: feeding habitat for benthic-feeding fishes; prey for piscivores that feed on resident oyster reef fish; refuges from low dissolved oxygen; physical structure that concentrates fish larvae and juvenile piscivores by altering flow; and physical structure required by cryptic, benthic-breeding, and territorial fish species (Coen et al., 1999; Breitburg et al., 2000). Chesapeake Bay oyster reefs have among the highest densities of fish recorded outside of tropical coral reefs and generally house higher numbers of species and individuals than nearby unstructured, soft-bottom habitat. Overall, studies in the Piankatank, Patuxent, and Fisherman’s Island reefs have recorded 57 species of finfish on oyster reefs in (Coen et al., 1999; Harding and Mann, 1999; O’Beirn et al., 1999; Breitburg and Miller, 1999; J. Nestlerode, unpubl. data). In many ways, the function of oysters to Chesapeake fishes is similar to that of corals in tropical waters. Oyster reefs transform the surrounding sand and mud habitat into a structurally complex environment replete with hiding nooks, abundant prey, and nesting sites for some species. Lenihan et al., 2001). Increased benthic prey also means greater feeding opportunities and potentially higher growth rates for fish that use oyster reefs. Due to filtration by oysters, near-bottom visibility over oyster reefs can exceed the visibility over surrounding soft bottom—indirectly affecting the feeding rates of fish that use sight to forage. 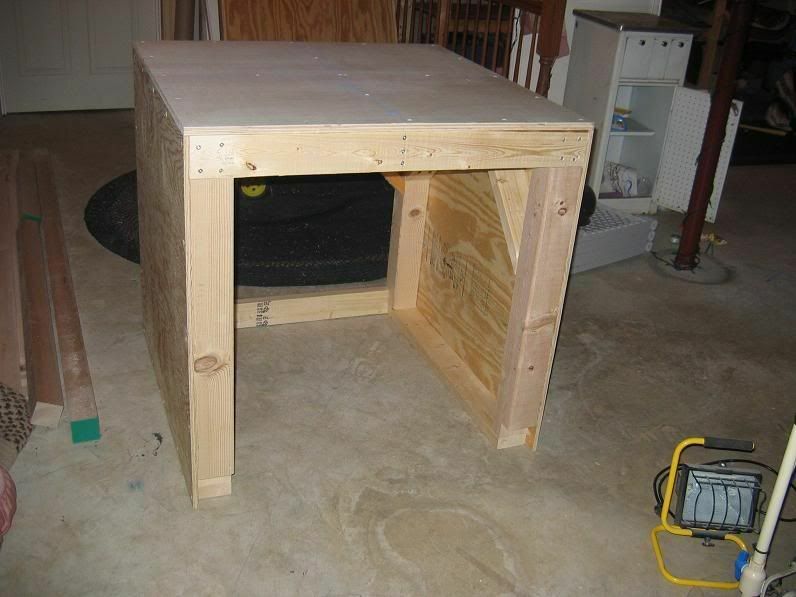 The sump height will depend on what you are doing with it. If it is simply a refugium/extra volume chamber, then it would be better to have its height the same as that of the main tank to spare the pumps and eliminate the risk of overflow. If you are incorporating a turf algae scrubber or trickle filter, then you should place the sump lower to provide room for the water to trickle down. Have you considered a gel superglue for attaching the oysters? It will set underwater. I believe it's used to attach coral plugs in reef tanks. Excellent idea Chasmodes! I believe a lot of us are going to try to live vicariously through you during your project. (So be sure to keep us up to date--with pics!) One small suggestion if I may. While they are a very unique looking and cool fish to keep, Pipefish almost always end up dwindling away after 6 months to a year. I assume you know that they'll require frequent feedings (at least twice a day) of adult artemia. You may have some luck getting them to take to frozen mysis shrimp which would cut down on the cost of always keeping brine shrimp on hand. I tried keeping them for a few years in conjunction with H. erectus but they never lasted as long. Besides, both them and the Lined seahorse like eelgrass beds. As others have said--the Bay is a very murky place now, which does not equate to ideal conditions for said grasses. Less eelgrass = less Pipefish and seahorses. You are on the right track with the rest of your species list. A few others I might recommend: juvenile Tautog and Filefish. They both love being around structure like you are set to build. Let me know if you need any other suggestions as I ALMOST enjoy our native Bay species as much as stream fish. Thanks for the excellent ideas Nathan. I've been researching algae scrubbers and I think that it's a good thing to do especially since my version of live rock may not work, or may. Either way, it seens like a great way to export nutrients and keep algae under control and increase microfauna diversity, perhaps the key to keeping the oysters alive. As far as attaching the oysters, yes, superglue gel is a good option too especially if I have to place individual oysters. If I can obtain clumps of oysters then I may go with foam.
" If the main tank has too much competition for food then I could keep them in the sump maybe..."
Spoken like a true fishkeeper! If there is a will, there is a way. I keep a few oysters in the sump of my reef tank to provide food for my corals. I was wondering if an oyster reef tank would have ample filtration to handle the bioload when the reef decided to spawn? I meant when the oysters spawn. I've been reading up on Algae Turf Scrubbers (ATS) and I really think that is an excellent idea, thanks to Nathan on that. I believe that nutrient export issues with no skimming will be resolved. From what I've read on other forums that there reefkeepers that report having spawning of their corals using an ATS without any spikes in harmful products. So, I will adopt using a scrubber. That said, I will purchase a skimmer in case I notice huge spikes that a scrubber might not be able to handle. Although I don't really see any problems it could be a good backup plan. Also, even though ATS users often report good results without water changes, my plan is to do a 10% change on a regular basis, maybe more if I have nutrient problems. I'm taking a reefkeeping approach to this build and hopefully lessons learned by coral reefers will translate to an oyster system as well. So far, the oyster reef ecosystem resembles a deep coral reef when it comes to lighting and care, even though one ecosystem is relatively shallow and the other is deep. The major difference is the oyster reef seems to thrive on murky fertile waters where deep water coral reefs are in crystal clear waters. Sessile invertebrates have no need for bright light and rely entirely on filter feeding for nutrition. All in all, it's a huge experiment and quite exciting to me. It started out as a blenny tank, but I want the entire biotope. Freshwater darter lovers would love this tank too I would think. I think of darters as being the closest thing to a freshwater version of a blenny (although I realize that there are some blennies from Vietnam that can live in entirely freshwater). Thanks for your input everyone! Next up on the agenda for me is to get the lighting issue solved, and in early January the stand should be complete. 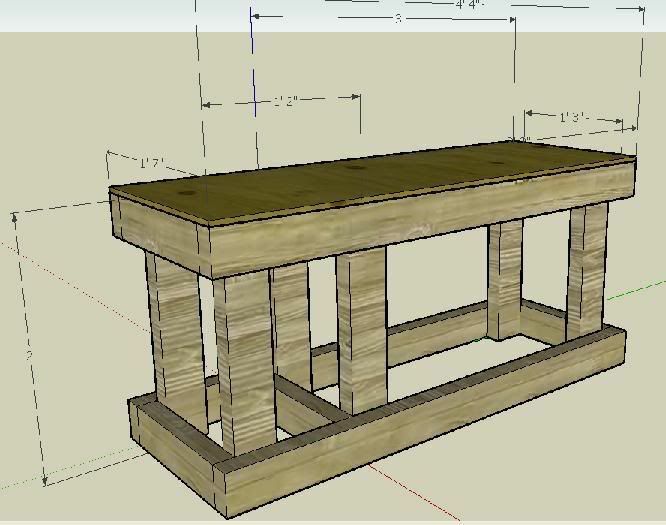 I could finish the stand sooner, but I want this to not only be very functional but also look good (to keep my Wife happy). Once that is done, then comes the plumbing and the ATS build. Then beginning to stock the tank with live sand, set up the sump, live rock, then cycling. After that, begin slowly stocking and monitoring...and hopefully by June have a blenny population. I will document each step of the way with pics too. This is really cool and I dig the fishes you plan to stock. Sorry if you covered this already but how do you catch blennies? I'm fascinated to see how this turns out. Thanks for taking the time to share and good luck!